In case you missed the news, the WolframAlpha search engine recently went “live.” In the run-up to the site’s launch, there was lots of buzz on the Internet about how it could be something that “challenges Google’s dominance” or may even be “the next Google.” As discussed in our prior coverage, however, WolframAlpha isn’t really a direct competitor to Google. While Google’s strength is its ability to find your search terms on relevant Web sites, WolframAlpha’s strength lies in analyzing your query and trying to return a result that answers the question you asked. In other words, Google uses its massive site index to find matches for your search terms while WolframAlpha tries to intelligently figure out what it is you really want to know. Similar searches are run by millions of Web users every day. If you feed those search terms to Google, you’ll get a list of about 7,530 matches. Send the same terms to WolframAlpha, though, and you’ll just see this message: WolframAlpha isn’t sure what to do with your input. Clearly, WolframAlpha isn’t the place to go to find out where you’re going to eat dinner tonight! If you approach WolframAlpha with the mindset that it’s a Google alternative, you’ll see this message often—very often—and probably be disappointed in the experience. In this case, both Google and WolframAlpha bring back matches. The first match at Google is this entry at Wikipedia, and if you scroll down, you’ll find a list of the languages used, ranked by percentage of population that uses each one. There’s also, however, a ton of additional information on the page—which can be good if you need a lot of background, or bad, if you just wanted your answer. Another difference between the results—Wikipedia versus WolframAlpha, in this case—is that the data for the WolframAlpha results is based on newer sources. Another big difference with WolframAlpha is the speed with which you can run a similar query. For instance, what languages are spoken in Romania instead of the United States. In WolframAlpha, you can just edit your query line and press Return, and the new results will then replace what you’re currently viewing. If you’re using Google, though, you’ll first need to get back to the Google page, edit and run the new query, then find a relevant answer amongst the list of matches. This isn’t too hard to do; in my case, the second entry in the results list provides a good match to my query. If you’re doing a lot of research, though, those clicks add up. The ease of re-running queries, and having the results displayed without changing pages, led me to run all sorts of queries, many of which only came to me because I was looking at some other set of results. If you’re inquisitive at all, the store of data in WolframAlpha’s database can be quite fun to dig through. WolframAlpha also makes it easy to see more results for your query; a More button expands the list of results, and a Less button reduces it. Search for tallest mountains, for instance, then click More twice to expand the list to the 15 highest mountains in the world. Click Less twice to get back to the original display of the top five. All of these searches are quite doable in Google, of course. However, you’ll probably wind up clicking through to multiple sites to collect all the information that’s displayed in one relatively-concise results page when using WolframAlpha. 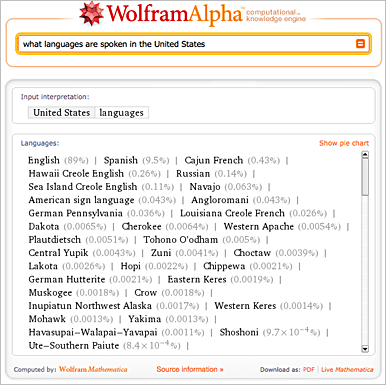 The possibilities are endless—even more so if you’re mathematically inclined, as WolframAlpha is built on Mathematica, Wolfram Research’s technical computing software. My math skills ran out at college calculus, however, so I’m not going to push WolframAlpha very hard with my math queries! But wait, there’s more, as they say on TV. To get a sense for just how broad-reaching this computational search engine is, check out some of the sample searches in the WolframAlpha gallery; they’re quite impressive. Is WolframAlpha going to displace Google? Not a chance. Does it bring some interesting new capabilities to the search realm, and will it be able to carve out a niche for itself? I think so, but only time will tell. For now, though, it’s an intriguing new alternative to traditional search engines.